From Chuck Rio and King Curtis to David Sanborn and Kenny G, take an inside look at the genesis of pop saxophone. This book with online audio provides solo transcriptions in standard notation, lessons on how to play them, bios, equipment, photos, history, and much more. 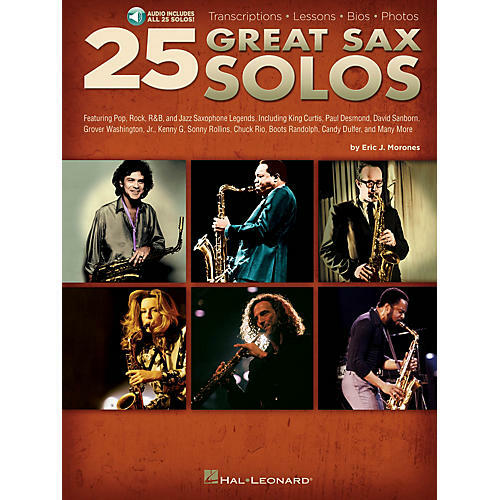 The audio contains full-band demos of every sax solo in the book, and includes the PLAYBACK+ audio player which allows you to adjust the recording to any tempo without changing pitch, loop challenging parts, pan, and more! Songs include: After the Love Has Gone · Deacon Blues · Just the Two of Us · Just the Way You Are · Mercy, Mercy Me · Money · Respect · Spooky · Take Five · Tequila · Yakety Sax · and more.